The genus Petrogale in the family Macropodidae, is a group of of marsupials commonly known as rock wallabies. 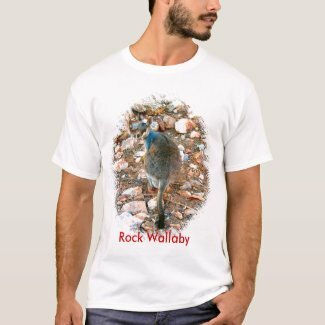 Rock Wallabies are no taller than half a metre, and it is their agility and speed as they travel across seemingly sheer cliff faces that amazes many people who are lucky to catch a glimpse of them in movement. When not moving, they blend almost perfectly into the rocky escarpment. Their ability to traverse rock faces is down to their powerful spring-loaded hind legs, textured soles providing maximum traction, as well as their muscular tails for steering and stability. Found living in the many rocky gorges, outcrops and escarpment throughout Australia, the caves and crevices provide them with shelter and protection from predators like the dingo and birds of prey. - Black-footed Wallaby, Yellow-footed Wallaby Usually found in hilly or rocky outcrops, gorges and escarpments of Australia. • Black-footed Wallabies can often be seen in the cooler months catching the early morning sun at the top of Meyer’s Hill and escarpments. • Best time to see is early morning or late afternoon during the hot summer months. During the colder months, they can sometimes be seen throughout the day, warming themselves high up in the rocks. • The Heavitree Gap Outback Lodge is located at the southern entrance to Alice Springs, the junction of the East MacDonnell and West MacDonnell Range. As well as accommodation and tavern/bistro, a popular activity and attraction is the Wallaby Feeding at sunset. Special feed is available for purchase from the Reception.